Your jaw is going to hit the floor when I tell you how much Kyria’s gorgeous bridal separates cost. The floaty skirt was lovingly made by Kyria’s Mum, using material bought from Fabric Land for a mear £20, and the lace crop top was a steal at £25 from Missguided. I know, unbelievable right. I told you you’d be impressed, especially as she looks stunning. 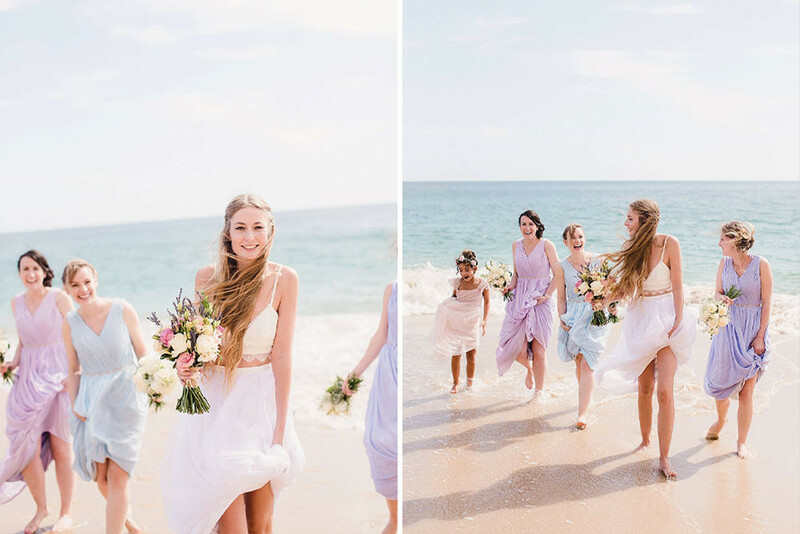 This whole bohemian beach wedding is utterly dreamy. Sandy shores, crystal sea and the glorious sun beaming down on you as you say I do under a DIY flower pergola must have been pure heaven. Then there’s the mis-match pastel bridesmaid dresses and Kevin’s map back waistcoat, plus a whole host of other creative DIY projects and fabulous inspiration to pour over. 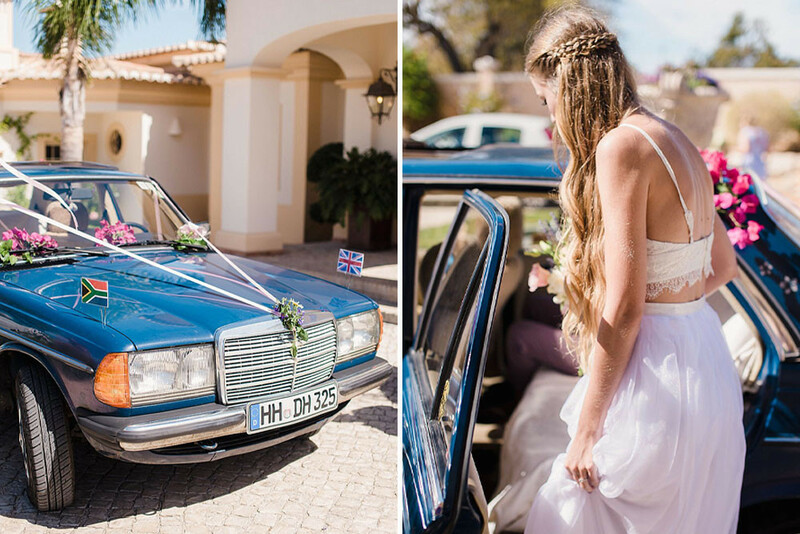 Kyria The Bride: I had tried on a few in wedding shops and felt they were a bit traditional for me plus didn’t like the idea of spending a thousand pounds or more on dress. After looking at some more alternative styles on Pinterest I decided I wanted a crop top and skirt. I found the top quite easily after an online search but was struggling with the skirt so my mum offered to make one and it turned out perfectly. I only wore the diamond stud earrings I wear every day, which were a 21st birthday present from my mum and 3 gold bracelets, including a hand chain, which were from the gold plated range at Accessorize. The engagement ring was designed by Kevin with the personal shopping team at Astley Clarke, so I also got my wedding band made by them to match the engagement ring. Kevin’s wedding ring was simple white gold band, panel beaten to give a nice texture, which we got made in South Africa. Didn’t wear any on the beach or at the villa. Wore some simple gold plaited flip flops from Accessorize for the photo session at the old fort. I used Michelle at XeliLagos. She made the bride’s and bridesmaids’ bouquets and a flower wand for our flower girl. I ordered the rest of the flowers for the pergola and venue through her but we arranged these ourselves. I just asked for a selection of pretty pale coloured flowers that were in season at the time. There was no particular order as I wanted a natural feel so my bridesmaid Hannah did an amazing job of arranging the flowers in all the pots in a random way using all the different colours and textures. We currently live in Portugal as we both love the beach so it was always going to be a beach ceremony. We chose Cabanas as it is a bit off the beaten track so always fairly quiet, with a stunning rocky backdrop and the advantage of a lovely beach bar. We chose a villa rather than a hotel as we wanted somewhere we could completely personalise, and not be restricted by any rules, other guests etc. Kevin had once filmed an advert at Quinta Paraiso so knew it was a stunning location with great outside space and views so we went for a viewing and both knew it was perfect straight away. We applied for a beach license from the local maritime police so we could use Cabanas Velhas beach for the ceremony. I chose an area the day before and Kevin’s sister (Candice Davies) arrived earlier on the day to set up the chairs and pergola (which she also decorated). We then had drinks at Cabanas beach bar. Kevin and I had photos here and at the local old fort. 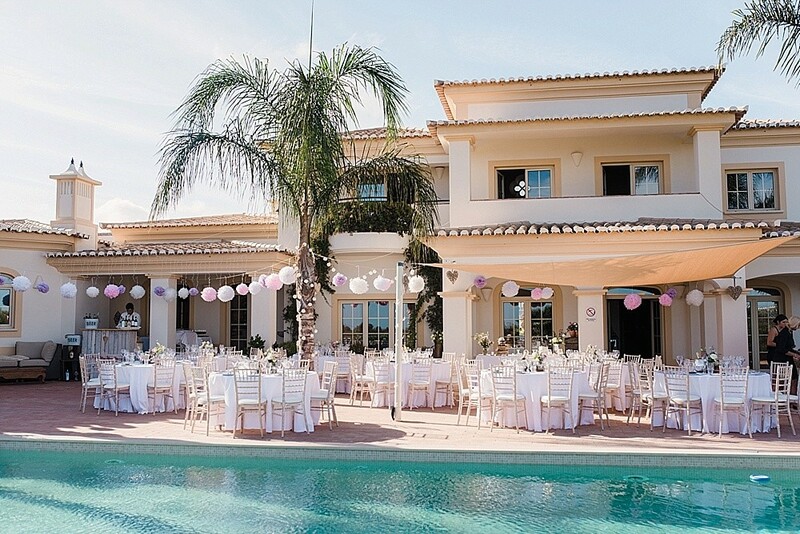 Then everyone was back to the beautiful villa Quinta Paraiso for the reception. We were able to rent this through a friend but it is also available on James Villas. All the decor items were sourced by us in the months before the wedding. I never really had a theme, just knew I wanted everything to look pretty and relaxed. 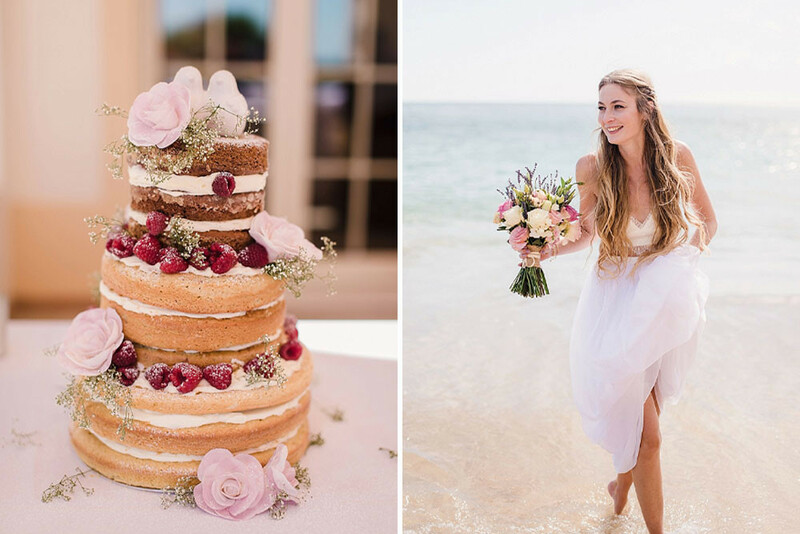 We have a restaurant in Lagos which is very bohemian and rustic, which reflects our personalities, and we wanted a similar feel for our wedding, just a little more refined and girly. I used to be a home textiles buyer (for Next among others) and Kev is keen on design so we find it quite easy to know what we like and the look we wanted to put together. I chose 4 different pastel colours for the bridesmaids and flower girl and carried this multicolour idea through to the decor. All the plates were different, each table had different pots, teapots and jars on. 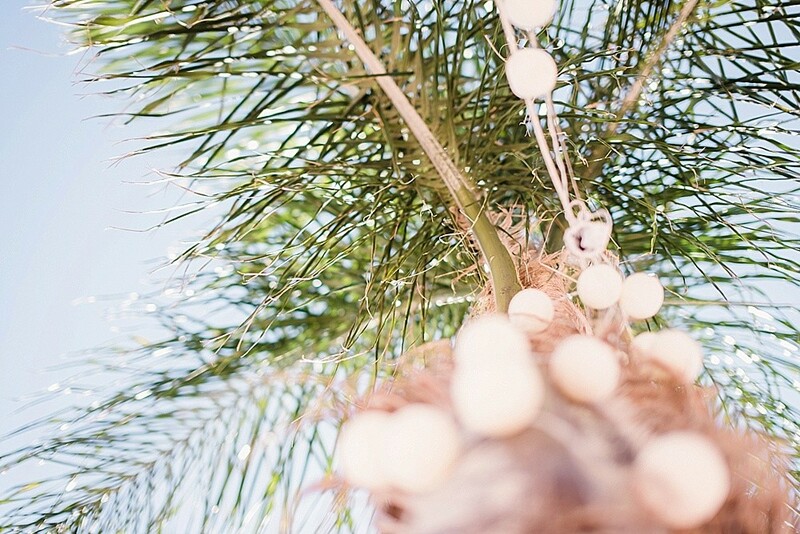 We had different colour paper pom poms and string lights randomly hung all over the place. The wedding morning was a crazy rush of my bridesmaids and I running around like mad getting everything out and laid out as I wanted it. 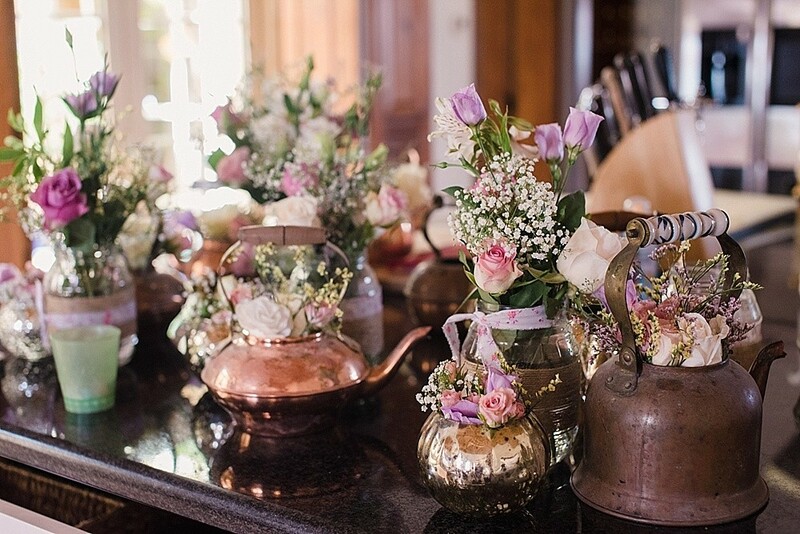 Particular thanks to my 3 bridemaids: Hannah Moisand, who did the most amazing job arranging the flowers in all the millions of pots and jars I had sourced; Sarah Brookes (and her boyfriend Paul!) for being team pom pom and Karen Warren for being the stamping queen (I made all the place cards and then she hand stamped every letter of every name). Also big thanks to Dave Mitchell and Scott Tesan for temporarily becoming lighting engineers to hang all the string light so beautifully. We found the vintage plates in charity shops and markets in the UK and Portugal. The teapots were all from local markets in Portugal, as were all the old watering cans, enamel jugs and other big old pots! Jam Jar vases were made by me with some scraps of material and string. Various mercuried glass candle and flower holders, wicker hearts and bunting were from The Range, Dunelm Mill and Matalan in the UK. Napkins for the tables from Zarahome and hessian potato sacks from the local farmers coop. The chairs, tables, table cloths, plates, glasses and catering equipment were all hired from Tom at Algarve Marquees. The Cake was made by Helen at Algarve Cakes. It was delicious (each tier was a different flavour, I went for chocolate, white chocolate and vanilla) and every bit was eaten on the day. She also perfectly encapsulated the natural and relaxed, but still pretty, feel of the day. The catering was done by John and his team at The Pickled Carrot. They were great on the day, with his team also helping set up the villa earlier on in the day and the food was fresh and delicious, just what we wanted. I had always envisaged a big rustic salad buffet and they delivered (with the help of an amazing table we found at the venue and some bowls we had collected). I ordered these, together with the dress my mum wore, from one of the Chinese websites Dylan Queen, which was a gamble as I have had mixed results in the past but it paid off as the colours were a perfect mix together and much cheaper than going to a bridal shop. All the girls had to take the hems up about a foot each but apart from that they came out well! I went for all different colours but the same dress. It was a relaxed flowing style to keep in with the feel of the day and the beachy aspect. The flower girl dress came from Monsoon and was so pretty I wanted to wear it! Kevin was never going to wear a suit, he’s spent most of his life in boardies and bare feet so we were looking for something relaxed but he still wanted to look like he’d made an effort. He wore some simple chinos and a white shirt from Massimo Dutti and a special waistcoat which we bought in a Market in Hout Bay, Cape Town when we were there last winter. (Kevin is South African). The map detail on the back was perfect for him as he spent around 15 years backpacking round the world before he settled in Portugal so it is a representation of his love of travel, as well as adding some nice colour! The best man and our ‘vicar’ my brother also wore chinos and a white shirt. The save the dates were tea towels designed for us. We loved them so much we have one framed on the kitchen wall now. I made the invitations using a stamp I bought from Etsy and some paper and card from our local papelaria. We had a local band called The Protons, they do an amazing range of covers, and were really really good! We all danced non stop and loads of people commented on how much they enjoyed them. We know them from living here so it felt like just a bunch of friends having a party, rather than just watching a band play. Our German friend Sugar offered to drive us in his vintage Mercedes. He decked it out with UK and South Africa flags and flowers on the day and it was perfect. 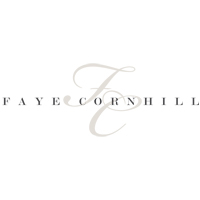 The totally amazing Faye Cornhill!! I am lucky to enough to know Faye (through an ex boyfriend!) and was thrilled when she was available to photograph our day. I have never seen such beautiful photos and while she was here it was much more like having a friend visit than a photographer, she was always offering to help while still getting amazing photos! I could not have imagined anybody else doing the job. From seeing her other work I knew the photos would be good but they really surpassed our expectations and we feel so lucky we get to keep these to look back on forever. 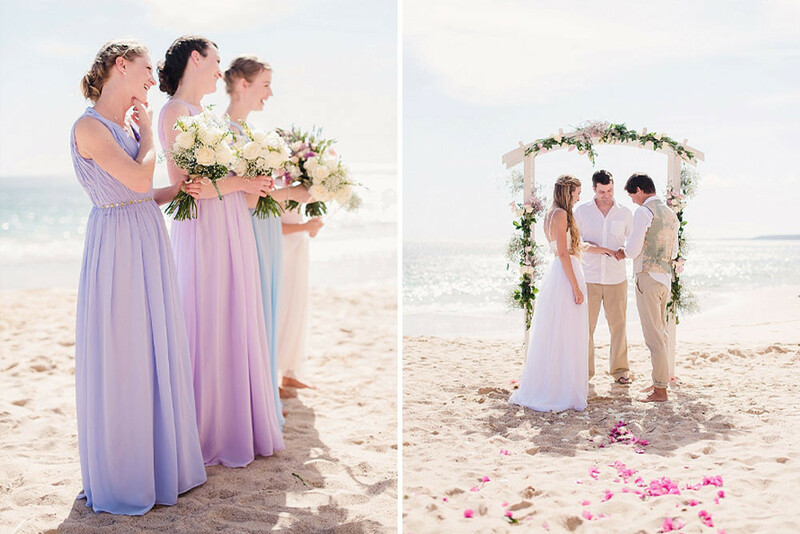 My brother, Nathaniel Davies, officiated the ceremony on the beach, he is a natural public speaker but he was even more amazing than I imagined. He wrote the script himself and it was completely perfect: funny, sincere, relaxed but meaningful. Our dad died when I was 19 so my mum gave me away and it was really special for me to have both of my immediate family involved in the ceremony. 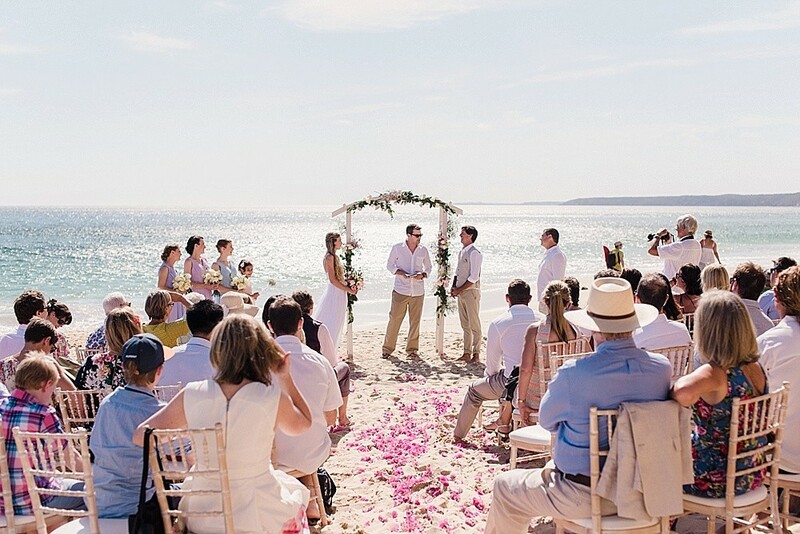 We had done the legal ceremony already in the UK so it meant we didn’t have to include any legal terms on the beach, which made it more relaxed and personal. We completely loved our day and the lead up to it collecting plates and decor bits wherever we were. It never felt stressful, I think because we weren’t set on a certain type of look or ceremony, we just went with whatever we liked and didn’t try to stick to any traditions. The morning of the day was crazy with me running around still decorating the villa at 3pm still when we were meant to leave at 3.10pm and I hadn’t had my make up done or got dressed! But everyone pulled together and the result was perfect. Once I sat in the car I was completely relaxed. We had people coming from all over the world (Kev’s family from SA, friends from Australia, USA, Switzerland, most of mine from UK) so really just wanted everyone to have a lovely time and get to see some of the best bits our current home has to offer. Many guests commented on how it was one of the most personal and relaxing weddings they had been to so I think/hope we achieved what we set out to do.